Born to be Wild? Passionate about preserving what is Wild or what remains of our planet’s wilderness? 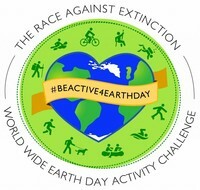 Make a positive impact this Earth Day by helping us create the first annual World Wide Race Against Extinction Outdoor Activity Challenge! Pick your favorite outdoor activity and go wild to benefit Mother Nature! You can participate anytime, anywhere and anyhow by selecting one of our many activity categories listed below and on active.com or help us create your own! Whether you choose to engage in your favorite outdoor activity and participate as a Lone Wolf or as part of a larger Green Herd, your miles and kilometers and registration $ will go towards our collective team goal with proceeds going to our exclusive charitable partner World Wildlife Fund. If you have any questions on setting up your Panda Nation page or anything else related fundraising for WWF please contact our friends at WWF at pandanation@wwfus.org. And finally, please help us grow the green herd by liking us on Facebook or inviting your friends, family, neighbors or colleagues to join us! as in “I Will Run 5 Miles for a Tiger” or “I Will Walk 3 Miles for an Elephant” etc. Please consider inviting your family, friends, neighbors, co-workers, students, classmates, fellow worshipers or science lab partners to participate and help us grow the herd and this event’s impact on preserving the wonders of our natural world! The Race Against Extinction is a 501(c)(3) nonprofit organization with a mission to generate greater awareness of the need to protect our planet's endangered plants and animals, raise money for the habitat preservation funds of established international conservation groups, and - perhaps most importantly - have FUN!